After so much pain and suffering for the Stark family, Game of Thrones’ most longed for reunion stirred up plenty of emotions. The sight of Arya and Sansa embracing before their father’s burial place was a rare moment of genuine happiness in George RR Martin’s brutal and unforgiving universe. Like many sisters, the pair had always been chalk and cheese and their sometimes viscious squabbles were some of the most relatable parts of the first season. However, they are no longer the innocent children they were when they parted at the point of Ned’s execution, and all rivalry and mischievous pranks appear to be put aside for now. 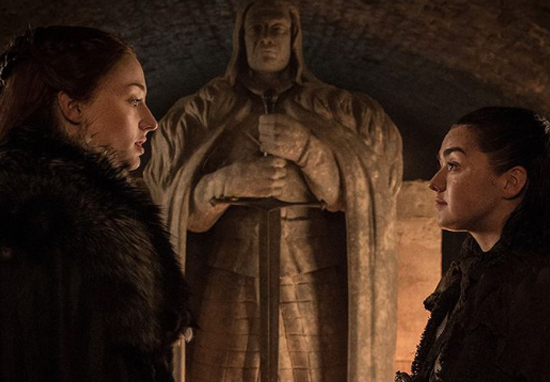 Sansa to Arya: "he was happy when he saw me, when he sees you his heart might stop"
Real life besties Maisie Williams and Sophie Turner, who play Arya and Sansa respectively, have been watching the moment right alongside thousands of weepy fans. With her usual sense of humour, Maisie tweeted at Sophie saying: “Honey, I’m home,” in direct reference to Arya’s return to Winterfell. Maisie and Sophie’s real life friendship is just as sweet as their on screen one, and decidedly less volatile. They have given themselves a joint name ‘Mophie’ and even have matching Game of Thrones tattoos.